The twenty-third in a series of posts highlighting buildings in East Wilson Historic District, a national historic district located in Wilson, North Carolina. As originally approved, the district encompasses 858 contributing buildings and two contributing structures in a historically African-American section of Wilson. (A significant number have since been lost.) The district was developed between about 1890 to 1940 and includes notable examples of Queen Anne, Bungalow/American Craftsman, and Shotgun-style architecture. It was listed on the National Register of Historic Places in 1988. In the 1880 census of Wilson, Wilson County: minister Charles Smith, 26; wife Virginia, 22; children Arminta, 7, John T., 3, and Charles H., 1; and brother-in-law Braswell Winstead, 20, teaching school. On 29 June 1899, Braswell R. Winstead, 38, of Wilson County, son of Riley Robins and Malicia Winstead, married Ada E. Davis, 24, of Edgecombe County, daughter of Washington and Virginia Davis of Edgecombe. Samuel H. Vick applied for the licence, and A.M.E. minister W.B. Williams performed the ceremony in Rocky Mount, Edgecombe County, in the presence, among others of John Barnes and John S. Gaston of Wilson. In the 1900 census of Wilson, Wilson County: assistant postmaster Braswell Winstead, 39, wife Ada, 25, and children Arnold, 13, George, 12, Rolland, 11, and Christine, 8. In the 1910 census of Wilson, Wilson County: Brazell Winstead, 48, street laborer; wife Ada, 32, dressmaker; and Martha, 31, and John Corbin, 34. Winstead reported having been twice married. In the 1920 census of Wilson, Wilson County: Braswell Winstead, 60, wife Ada E., and daughter Ethel L., 13, at 300 Pender Street. By 1925, Ada Winstead’s dressmaking business, Ada’s Modeste Parlor, was booming at 108 West Nash Street, the heart of downtown. She employed at least five dressmakers to cater to her white clientele, including her sister-in-law Ella Davis, Louise Wilson, Lovella Cotton, Eliza Best, and Lessie Locust. The city directory for that year shows the spacious house at 415 East Green occupied by carpenter James W. Davis (Ada’s father); Ada Winstead and her husband Braswell R. Winstead, a barber at Sanitary Shaving Parlor; Otho Davis, a grocer at 303 Hackney Street; his wife Ella Davis; Louise Wilson; and sisters Lovella and Novella Cotton. Braswell R. Winstead died 22 August 1926 in Wilson. Per his death certificate, he was born about 1866 in Wilson County to Riley Robins and Malissa Winstead; worked as a barber; resided at 415 East Green Street; and was married to Ada E. Winstead. He was buried in the Masonic cemetery. On 3 August 1929, Ada A. Winstead, 48, and Nazareth A. Pierce, 53, were married in Wilson by A.M.E. Z. minister J.E. Kennedy. Witnesses were John M. Barnes, Mary Roberson and George Roberson. In the 1930 census of Wilson, Wilson County: at 905 Vance Street, insurance agent Nazareth Pierce, 54; wide Ada, seamstress; son Fletcher, 17, and daughter Elmira, 25. In the 1930 census of Wilson, Wilson County: at 415 East Green, widow Virginia Davis, 65; son Otho, 36, a grocery merchant; daughter-in-law Ella, 36; grandson Otho Jr., 15; and two roomers, Robert Hines, 45, Christian church janitor, and David Hinderson, 25, a butler. Virginia owned the house, valued at $3000, and reported that she had been born in Virginia to parents born in England. Ada Winstead Pierce’s brother, Otho C. Davis, died 21 September 1934. Per his death certificate, he resided at 415 East Green; was married to Ella H. Davis; worked as a storekeeper; and was born about 1885 in Danville, Virginia to James W. Davis and Virginia Richardson. 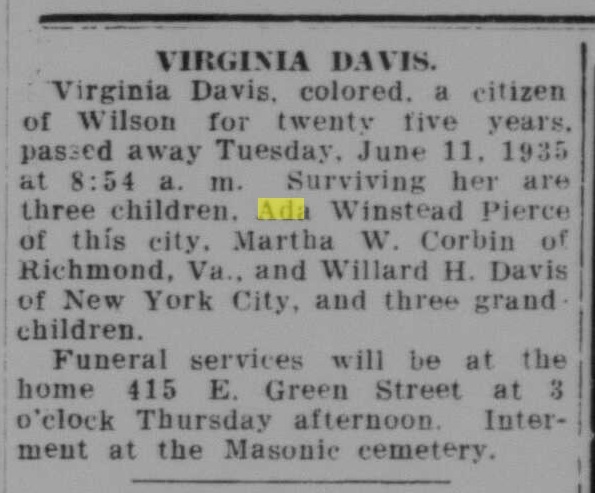 Ada Winstead Pierce’s mother, Virginia Davis, died 11 June 1935. Per her death certificate, she resided at 415 East Green; was the widow of James W. Price; and was born about 1865 in Virginia to Randle Jefferson and Francis Terrell. Wilson Daily Times, 13 June 1935. In 1940, Willie Johnnie Sarvis Jr. registered for the World War II draft. Per his registration card, he resided at 415 East Green Street; his telephone number was Wilson 2193; he was born 7 December 1905 in Norfolk, Virginia; he worked for Ed Bishop, Carolina Laundry, Tarboro Street, Wilson; and his contact was Ada Winstead, 415 East Green, friend. Nazareth Pierce died 16 February 1941 in Wilson. Per his death certificate, he was born about 1877 in Franklin County, North Carolina, to Adam W. Pierce; lived at 415 East Green Street; was married to Ada A. Pierce; and worked as an insurance agent. He was buried in Rountree cemetery. Joseph L. Pierce was informant. Ada E.W. Pierce executed a will on 2 June 1949 in Wilson. She left all her property, including the houses at 413 and 415 East Green, to her great-nephews Otha Richardson Davis Jr. and James Rudolph Davis in a trust to be administered by Branch Banking & Trust Company of Wilson. 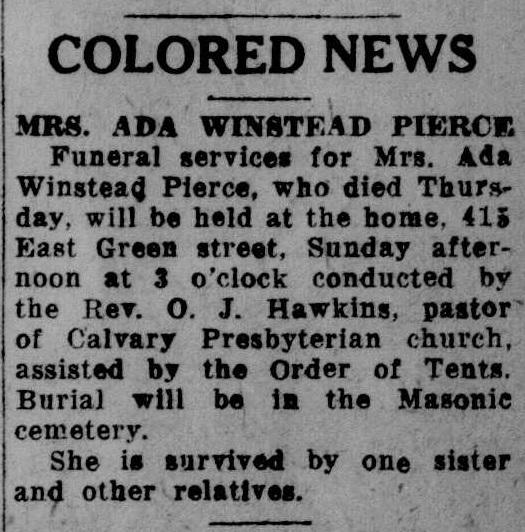 Ada Winstead Pierce died 10 November 1949 in Wilson. Per her death certificate, she was born 8 February 1881 in Virginia to James Washington Davis and Virginia Richardson; was widowed; was a dressmaker and seamstress; and resided at 415 East Green. She was buried in the Masonic cemetery. B.O. Barnes was the certifying physician, and C.E. Artis handled funeral arrangements. Wilson Daily Times, 12 November 1949. Otha R. Davis passed in 2009, age 91. Otha Davis Jr. passed in 2011, age 72. 415 East Green Street remains in the family. ← Obituary of Mark Benjamin Sharpe.